Denmark is known to be the country that has the happiest population on the planet. Of course, those statistics involve more than the rate of depression. The lifestyle is excellent in Denmark, the people do not work as much, and how could they be unhappy if they have a lot of famous amusement parks? You must have heard about Tivoli, right? It is one of Denmark’s main attractions. Copenhagen, its capital city, is a very charming place with a lot of museums, music festivals, and let’s not forget about the food. All in all, Danish people have it good. Before planning your trip to Denmark, you need to check if you need a visa or not. It depends on where you are from. The country is in the European Union and a part of the Schengen Area Agreement, which means that you need a Schengen visa. However, that is not the case in two cases. One, you are from within the European Union, and you enjoy the freedom of movement, and two, you are from one of the visa waiver countries (Annex II). If none of the situations apply, you must obtain a Schengen visa. To see in which category you are, you can take a look at the visa policy of the Schengen Area, or you can use iVisa’s Visa Checker. The latter is a much easier solution since there is not much reading involved. Just choose your nationality from the drag-down menu and put Denmark as your destination. If you do not need a visa, that's fine. If you do, you will be given a list of the embassies you can use to apply. What you should know is that it is not necessary for you to apply for a Schengen visa at the embassy of Denmark. According to the visa policy, if you go to Denmark only, then sure, you need to visit the nearest Danish embassy. However, if you have multiple destinations, you need to apply for your Schengen visa at the embassy of the country that is your primary destination. If that cannot be determined, you need to submit your application for your visa at the embassy of the country you visit first. So, if you plan to go to France and then to Denmark, the visa that you get from the French embassy grants you entry in Denmark as well. 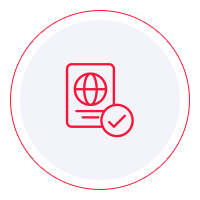 In case you are neither visa-exempt nor in the visa waiver program, you must ensure that you meet all the requirements. Although you can do your research on the internet, we recommend that you call the embassy itself. It is the most legit source of information. Websites are not always brought up to date, and that can lead to errors. Just give the embassy a call, and you will find out what you need to know. However, what we can tell you is that you need a passport that is valid and remains as such for at least another 6 months from the date of arrival in Denmark. For further information, contact the nearest Danish embassy. iVisa cannot process Schengen visa applications, but we wish to help any way that we are able. Hopefully, the information above is of some assistance. For further information, you can contact our support service which is available 24/7.